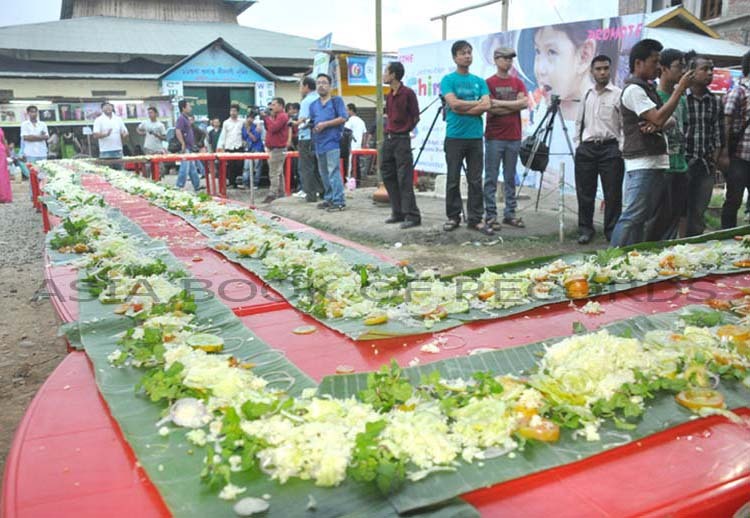 Imphal, Oct 4 : The 100-meter-long green salad displayed at an Imphal food festival in April has entered three prominent record scripting bodies- Limca Book of Records, India Book of Records and Asia Book of Records. Measuring 6 inches in width and weighing 781.3 kg, the vegetable salad was prepared in 1 hour 10 minutes and 51 seconds by 15 volunteers of Innovative Youth Society (IYS) and BOSS Juices, Manipur at the third Chinjak (food) festival- International held in April this year under the aegis of IYS. Prepared with cucumber, tomato, cabbage, mint, cheese and spices, the salad was placed on dozens of banana leaves neatly arranged over 40 tables sprawling over two rows. Hundreds of visitors who had arrived at the event were in for a treat as they were allowed to get a free taste of the record-breaking salad after the show was over. A delegation of the Manipur tourism department headed by commissioner K K Chhetry were official witnesses. "We are so glad that our efforts got the much-deserved recognition by the three prominent record scripting bodies. We will organize a grand celebration for our success during the ensuing Sangai festival, the biggest state-sponsored annual tourism festival scheduled to begin from November 21," said Khuraijam Athouba, secretary of IYS and managing director of Chinjak festival. Imphal: The 100-meter-long green salad displayed at an Imphal food festival in April has entered in three prominent record scripting bodies- Limca Book of Records, India Book of Records and Asia Book of Records. Prepared with cucumber, tomato, cabbage, mint, cheese and spices, the salad was placed on dozens of banana leaves neatly arranged over 40 tables sprawling over two rows. Hundreds of visitors who had arrived at the event were in for a treat as they were allowed to get a free taste of the record-breaking salad after the show was over. A delegation of the Manipur tourism department headed by commissioner K K Chhetry were official witnesses. "We prepared the longest salad in the country not only to incorporate it in the record books but also to promote tourism in Manipur. Setting the record would attract more tourists for our next Chinjak festival and other state-sponsored tourist promotion events," Athouba said at a media conference here on Wednesday afternoon. As many as 54 stalls including eight run by seven Southeast Asian countries- Thailand, Cambodia, Laos, Hong Kong, China, Tibet and Singapore - displayed an array of 160 different mouth-watering indigenous cuisines and 40 international dishes during April's Chinjak festival. The festival gave thousands of youths the opportunity to taste the rare indigenous food items like Kongreng Bora, Chakhao Tan, Phola, Fried Naoshek, fermented passion fruit drinks and the rest, Athouba said. Visitors also enjoyed varieties of Asian cuisines like Korean Kimchi-fermented vegetables, Chinese Shark soup, chicken stew, chicken fried with ginger and golden brown egg boiled with herbs and Thai-noodle dried fry, fish fried rice, fish salad and so on. "In the fourth Chinjak festival likely to be held in January next year here, we will try to cover more countries," Athouba said.